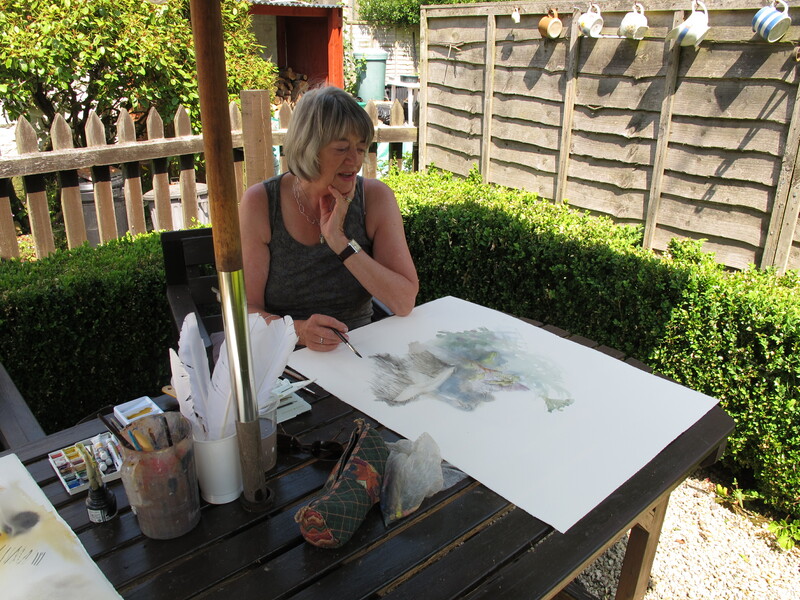 A few of Diana’s thoughts on art practice, and Sandy sketching in her garden……..
Sandy and I spent a day in my village of Llanarmon sketching and enjoying a delicious lunch at The Hand. Not only was the sketching really useful, it got us talking about our art practice and where it might be going, or not as the case might be. Artists, like writers, can be up high on a creative wave, or down in the shingle waiting for the next wave to take them up on high! Whilst the crest of the wave feels exciting and sometimes scary as thoughts rush in and ideas flow, down in the shingle is something one needs to recognise as being equally valuable. 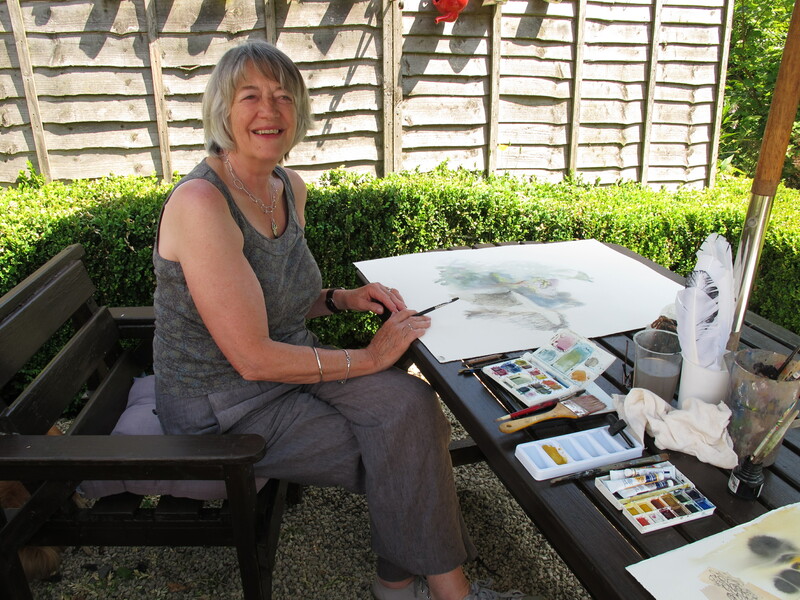 c)Sort out ones brushes and other tools – ones working space, if you have one, or create one, however small, – or create a new additional one, (perhaps temporary) – however small……….now there’s a thought. d)I have also found that positioning a few “toolkits” (a sketchbook and pencils etc) for sketching around the place, can act as an invitation to some casual mark-making (don’t call it drawing or sketching, just mark-making) (And which of us has used up every last page of every sketchbook we have ever used? – ideal moment to start using up those blank pages. f)walk, exercise, mull, do non-art things, but keep “open” to the visual, auditory, sensual and kinaesthetic world. 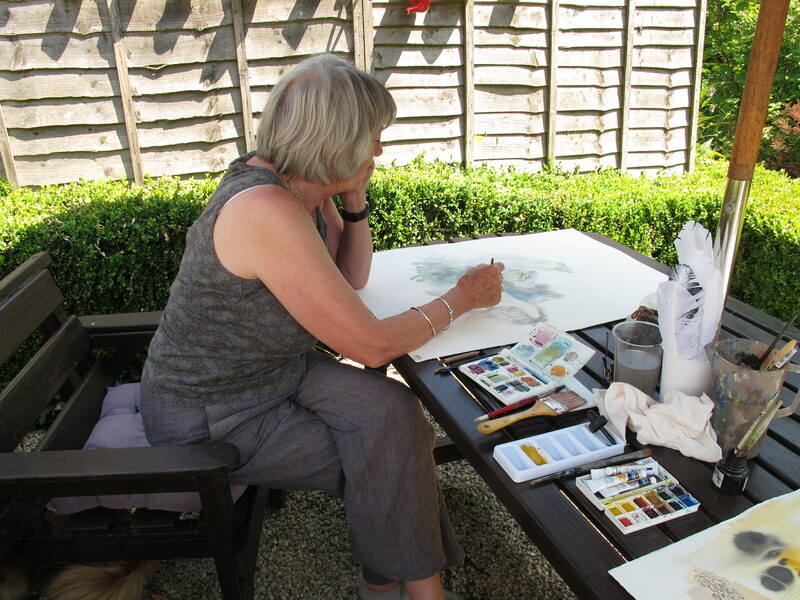 g)book yourself on a short art course that attracts you. Take heart – the wave always returns at some point, but ONLY IF YOU STOP TRYING TO MAKE IT RETURN! You’re absolutely right, Diana: I think all of this is important to give one’s art practice some context, too. Sketching days, meetings with other artists, visits to exhibitions – these all help make sense of what we’re doing out there on our own. The “bigger picture”, if you like! SO true Chrissie – I like the term “fertile void” – and yes it can be applied to other times in ones life. It’s in fact essential to the creative output isn’t it!